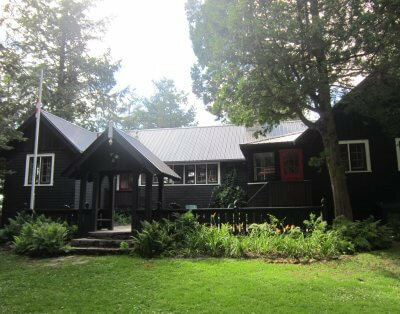 Elite and exclusive cottage and boathouse on Lake Joseph! Designed with a young family in mind – this custom-designed professionally-decorated cottage has a spectacular landscaped property and lakefront paradise! La Timonerie is located near Woodroffe Bay, close to Foot’s Bay on Lake Joe, only 2 hours from Toronto. With attention to every detail this stunning property truly has it all. Beautiful landscaping around main cottage with a stunning lakefront stone patio offers plenty of lounge areas to relax, enjoy the sun, barbecue, dine, and even roast some marshmallows on the fire pit. Granite steps lead you to the lakeside and the striking boat house with finished interior – perfect for entertaining! – Soak up the sun on the huge dock area, complete with Muskoka chairs. Fun for the kids include a trampoline, pint-sized picnic table and Muskoka chairs, tubes, aqua lily water play mat, paddle boat, SUP, kayak, and more! 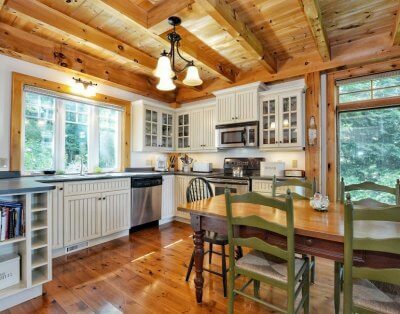 This cottage boasts a beautifully decorated interior that is both stylish and sophisticated. With distressed wood floors, vaulted ceilings, wall to wall windows, and attractive décor touches throughout, La Timonerie has unsurpassed Muskoka charm and character. The Great Room features comfortable cozy seating with a wonderful floor to ceiling stone fireplace. Doors open to the expansive upper deck with a magnificent view of Lake Joe. The fresh white kitchen features a double Wolf gas cooktop, sub-zero fridge and freezer, wine fridge and Miele coffee machine – perfect for the gourmet chef in you! The dining area boasts a rustic one-of-a-kind harvest table and seating for 10 – room for the whole family! The Muskoka Room is an incredibly inviting space with wrap-around windows on three sides, spacious and filled with light and views of the lake and woods behind the cottage. A 2pc powder room and convenient drop zone storage beside the main entrance round out the main floor. A staircase from the foyer leads up to a playroom – great for the kids to have their own space by day – and doubles as an extra bedroom with a pull-out sofa by night. With nine-foot ceilings and windows that stretch to within a foot of the ceiling, the lower level opens out to the lakefront stone patio. The Master Bedroom – simply gorgeous – features a King bed, immaculate 3pc ensuite bathroom with glass shower and a walkout to the patio. The second bedroom features a lovely Queen bed, while the third bedroom – perfect for the kids – features a double/single bunk and a crib. All bedrooms have been thoughtfully designed with built-in cabinetry and are bright and spacious with huge picture windows facing lakeside. A convenient laundry room with washer and dryer round out the lower level. Absolutely stunning boathouse with a tastefully furnished interior deck features a kitchen preparation area complete with fridge and microwave and comfortable seating and lounging, along with a 2pc powder room. Optional Services: Concierge Services available at additional cost.